There are multiple options for setting shuttle on this section. I prefer to park at the take out and hike the High Bridge Trail to the dam. Other than the steps at the beginning, it’s mostly flat for the ~1 mile hike, but I’m carrying a Jackson so your opinion may differ! Take OH Rt. 8 to Howe Ave. exit and head west. At the light turn right on Front Street. If you want to run the right side of the falls, cross the bridge and turn left at the next light into the Gorge Metro Park parking lot. Follow the trail to the observation deck. If you don’t want to run the falls (or want to run the left side), turn left into the small parking lot before the bridge. This is the beginning of the High Bridge trail that will take you to the dam. Just pass the dam on your right (~100 feet) will be a trail to the river. Another putin option is to stay on Howe Ave and go straight at the first light (Front St.). Howe Ave turns into E. Cuyahoga Falls Ave. at this light, go past Swensons, turn right at the next light on Clifton Ave. Take Clifton until it dead ends into Riverside Dr. Street parking is available on Clifton Ave. walk to the intersection of Clifton/Riverside and turn right. Look to your left for the trail to the dam. The trail can be steep and muddy near the end and puts you on the High Bridge Trail at the top of the dam. From the light at Howe and Front Streets, proceed SW past Swensons (on left) down E. Cuyahoga Falls Ave. for ~1.3 miles. Turn right at the light on Howard St. (Liberty Harley on your left) and head north. At the second street turn left on Uhler Ave (west). Go ~0.5 mile to the intersection of Cuyahoga Street (4-way stop) and turn right. Proceed ~0.3 mile to the park entrance for the Chuckery Area, turn right. Drive all the way to the last parking lot. From this parking lot you can take either the High Bridge Trail to the putin or the short trail to the river at Peck Road hole. The river side trail can be used to hike up to State Road (blue suspension bridge) for park and play options. A permit is required for accessing this section of the river. Metro Parks Serving Summit County requires one valid permit (annual issuance) in each group of 6 paddlers. A PDF version of the kayaking permit can be downloaded from here and you can fax your completed permit to (330-867-4711) for approval and issuance. This is a shallow river underlain by shale/sandstone layers which create ledge drops, numerous surfing waves, and foot entrapment hazards. Eddies can be scare in some sections and swimmers can have a hard time depending on depth (flows). The main hazards are strainers which can come and go after rain events and water quality which can degrade during heavy precipitation due to several CSO discharges in the watershed. This is a fun section that offers little to no warm up and a playful set of surfing waves when it’s running (usually during Spring, and after big rains). The real fun begins about 800 cfs when this section is Class III-, but at 1400 cfs it begins to get that bigwater feel. Once the level reaches 2000 cfs, the river gets a push to it and the rating increases to Class IV-; so bring your ‘A’ game to handle the fast flow below the dam. There is plenty of surfing but you have to take most of it on the fly and a lot is at the beginning. If you want to run the falls (original Cuyahoga Falls namesake) the put in is on river right, below the observation deck. The shelf next to the pylons is the best option for dropping the falls. Stay right to avoid the large pinning rock at the center of the falls! After to falls, you want to be left of center as you enter the first rapid since the right side is shallow. A large eddy is on your left after you punch through this first hole. This eddy is the alternate put in for those who don’t want to run the falls or when the level is too high for a safe run of the falls. Take a few rides at this spot and contemplate the view of the dam and think about what if? 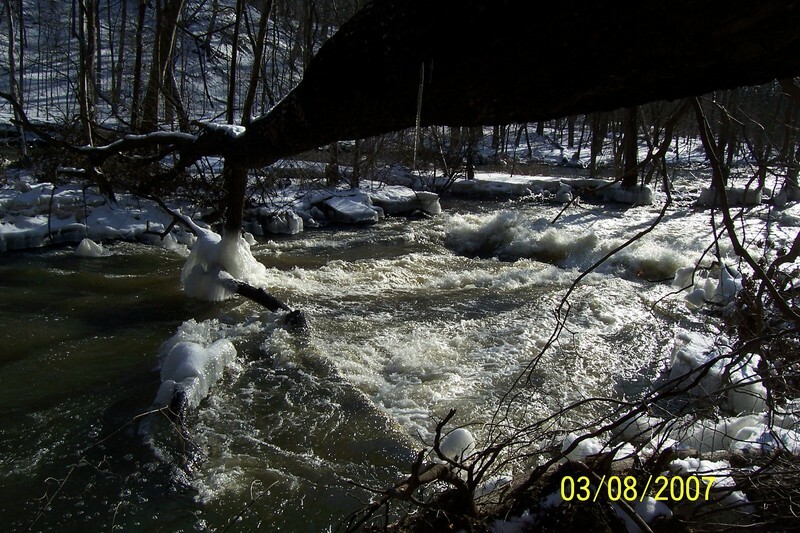 As the river bends, it is mostly quick water with several eddy’s on the left and 2 new (2010) large rocks on the right. It is nice and swirly behind these rocks at all levels, and when they are padded with water boofs are good with enough speed. Next up is the largest rapid on this section. Butterfly Rock is a river-wide hole that is trashy and has caused some good paddlers to swim, so pick your lines carefully. At lower levels (<700 cfs) a 1 o’clock angle with a boof over the left center line should clear you of the hole. Otherwise, hug the right side of Butterfly Rock and stay left to keep from getting surfed in the hole. You can also run the far right side almost at the base of the cliff. Just be aware that you need to keep your speed on this line and not slide into the hole. The sneak route is to the left of Butterfly Rock, but it can be shallow. "View of Butterfly Rock from Gorge Trail on river right. " After the pool below Butterfly Rock, up to 4 small ledges on river left create some decent surfing waves. "Overview of the river section between Butterfly Rock and the surfing wave below Matt's Pin rock (~200 yards)"
Its best to run down the left side as an eddy is usually available after each ledge. The last ledge feeds into a large rock (Matt’s Pin rock) that has a narrow passage on the left which leads into a pourover. The left passage has wood and should be avoided! 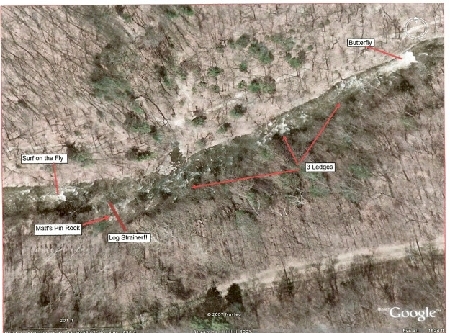 "View of Matt's Pin rock and the current log blocking the left side"
This spot will catch wood and can be sketchy so a safer line is toward right center. At this time, a several large logs are broached on the rock and extend in both directions. Stay well to the right!. 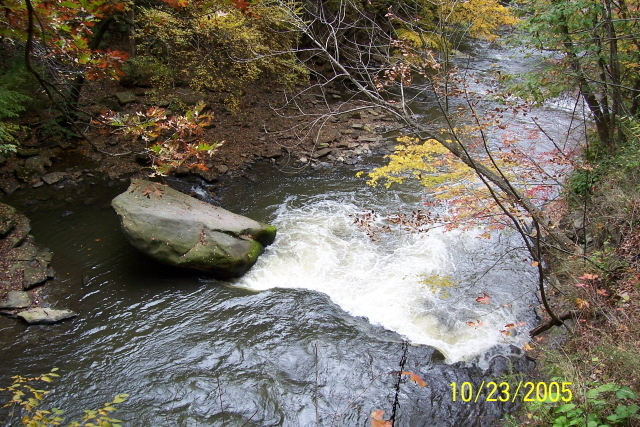 After this large rock on the left, the river narrows and a decent surf wave forms in the center channel. This wave needs to be caught on the fly as eddy service is limited. The next feature is a small boulder garden that is flanked on the left by a large section of the former steel penstock. This section of penstock is about 10 feet long and parallel to the flow, so stay clear since it acts like a sieve at higher flows. The 3 Bears seemed to have disappeared and the 2 larger rocks downstream on river left have created a nice pour over/eddy line to play on. In addition the old "Carp Eddy" on river right has been cleaned up due to improvements of CF sewer lines. They replaced about 500 feet of sewer lines on river right and the construction added some new features in this section while improving water quality. As you approach the blue suspension bridge (State Road), the left hillside is starting to slump into the river with some trees so stay alert as this will move. Work your way to the river right side to get a view of the S-Turn below the bridge. There is an underground sewer line that passes below the river at the beginning of the S-Turn rapid and a sewer manhole sticks out of the water on river left. Make sure that you DO NOT take the channel left of the sewer manhole below the bridge since it is usually a sieve fest; and at levels above 1100 cfs the flow wants to push you in there. "Left channel under blue Suspension Bridge (State Rd.) and the sieve fest awaiting the unwary"
Stay right of the manhole and try to catch the pourover/wave feature on the fly for a surf. As the river turns back to the left, there are 2 small eddy’s on river right that you can use to surf to few waves at the end of the S-Turn. These waves are fast and offer up good rides at most levels. Next up is one of the CSO pumping stations (#33) on river left which you will smell, but it rarely runs. There is usually a decent wave here that needs to be caught on the fly. About 50 feet past CSO#33 is a decent spinning spot on the right known as Hilarities Wave with excellent eddy service on river right. 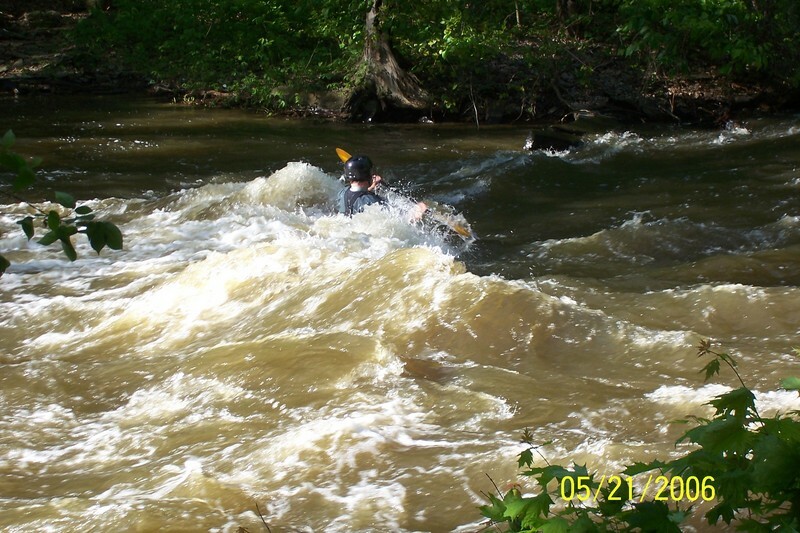 "Hilarity Wave - the center portion is steep but can be tough to get on (1100 cfs on USGS and 970 cfs on AHS gage)"
Just after Hilarity Wave a small stream enters on the right. If this stream is running, get out and take a look to see if there is sufficient water for the steep slide (60 feet drop in few hundred yards!). As you eddy out of this feeder stream a large hole forms about 50 yards down on the left, but there is always a tongue through the center even at higher flows. Things slow down after this point and there is not much left except 2 large holes before the takeout. As you approach the island, the left channel will be the easiest and is read and run. There is a tree near the top that you can go under below 1500. The center channel has a fair amount of wood and should be avoided. The right channel is a slide that leads into a river-wide hole that is sticky and log choked on the right. 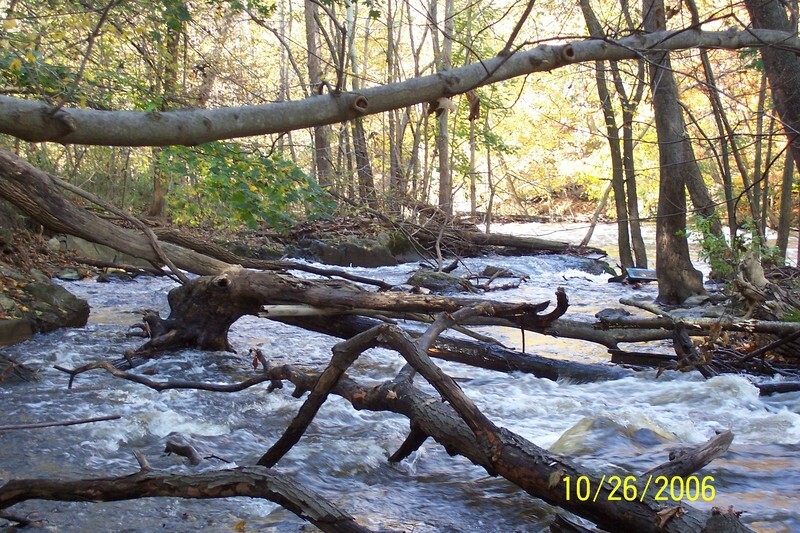 There is also a tree/strainer on the river right bank parallel to the flow and at the base of this slide. There is an eddy on the left at the top of the slide that allows you to boat scout the slide for any additional wood. "View of the right side of the island showing some of the wood near the base of the slide. The left side of this slide is open and the hole can be punched on the left (770 cfs on the AHS gage)"
Two large trees fell into this slide and one is suspended well above the slide. There is a seam in the center of the slide that leads into the meaty part of the wave so stay right and ride the reactionary wave into the bootom. You want plenty of speed before you hit the bottom since the slide is shallow and tends to slow you down and set you up for a beating. At flows around 950 cfs, a sweet surfing wave forms ~50 feet below the base of the slide. This wave has been the one of the better ones and excellent eddy service available on the surfers left warrants some time at this spot. Just downstream from the island is Peck Road hole which is a ledge drop. This spot has changed and is no longer the surf spot it used to be, but there are a few spots downstream to catch on the fly. Just down stream is a bench on river left and the takeout is 100 yards down stream of this bench. This next 100 yards holds a few pourovers, the Kings Wave and the 3 Queens. Conservation Organization: check out the Friends of the Crooked River, who've been working on cleaning up the Cuyahoga and educating the public for 11 years. A new hydro license proposal would dewater a nice rapid and preclude opportunities for dam removal. The below suggested levels were based upon the historic USGS gage data (unless noted otherwise) which includes flow input from the Little Cuyahoga River. Class III at 1200 or above. IV- at 2500 or so. 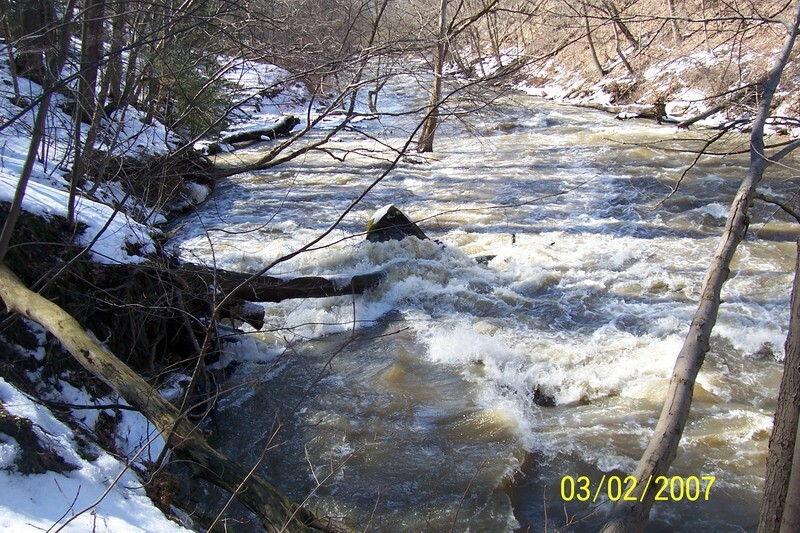 In a letter dated June 14th, 2007, FERC officially pulled the plug on the proposed hydropower project on an old outdated dam on the Cuyahoga River. Today the proponents of a hydropower project on the Cuyahoga River sent the Federal Energy Regulatory Commission a letter withdrawing their permit request. The proposed project would have dewatered a local paddling spot called Butterfly Rapids, impacted a public park, and assured the maintenance of a dam that has long been a prime candidate for removal based on its environmental and recreational impacts.